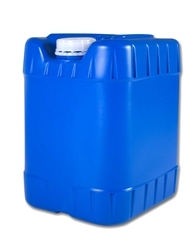 5 Gallon Water Container w/ Tamper Cap. Low profile carrying handle molded into top. Square design makes it perfect for stacking and storing. Add Seven Seas Water Preserver (8 drops per gallon) to obtain a 5 year shelf life.